← 3M, Minnesota settle water pollution claims for $850 million on day jury trial set to begin; State was seeking $5 billion, Company still faces at least 24 similar lawsuits filed in courts across U.S. Note that the Quebec court heard the trial over 9 days in September 2017 and ruled in only 5 months, on a much more complicated matter than the Ernst vs AER preliminary motion (not a trial) that the Supreme Court of Canada heard over 2 hours yet took over a year to rule (both time frames include Christmas holidays). 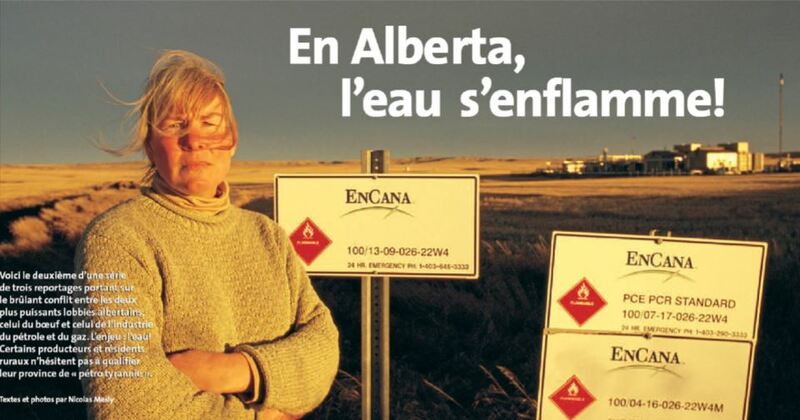 The Couillard Liberal government of Quebec chose silence and gave zero support to Ristigouche trying to protect its drinking water, same as the Notley NDP government of Alberta did in Ernst vs AER at the Supreme Court of Canada trying to hold the AER accountable for violating her Charter rights instead of regulating Encana after the company broke the law, frac’d and contaminated Rosebud’s (also a tiny community) drinking water. How about ALL of its legal fees to be covered!? Canada needs to make sure that SLAP lawsuits are illegal here! I hope this little victory can become jurisprudence for other bigger cases. Good for them! David and Goliath, and David won. Gastem’s owners need to ask themselves: would THEY drink contaminated water? 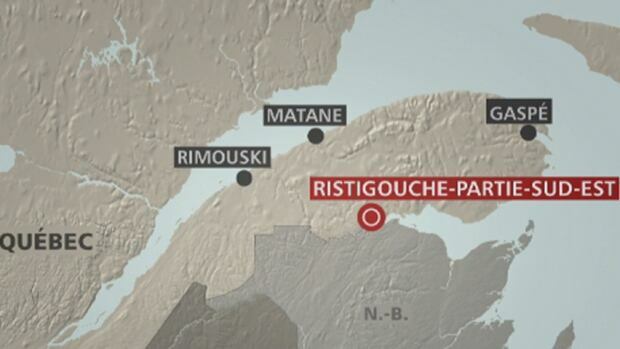 I’m very relieved and happy for the residents of Restigouche Sud-Est! Now the emphasis has to be on changing provincial rules. Quebec’s emphasis is on clean and renewable energy. This is a good news story that all municipalities in Canada should be aware of. So, once again we see a greedy corporation willing to risk the lives of Canadians in it unending quest for more and more profits, and even willing to sue those Canadians who have the audacity to stand up to it and the risk it creates. A small Quebec town that was facing a $1-million lawsuit from an oil-and-gas exploration company for trying to protect its own water has won its court battle and could see half of its legal fees reimbursed by the Montreal-based company. The municipality of Ristigouche-Sud-Est has been waiting on this decision from Quebec’s Superior Court since August 2013, when Gastem sued the municipality of 157 people. Mayor François Boulay said citizens have been worried and anxious for the past four years. He was relieved to see the judge ruled in their favour. “I can’t hide this is a sweet moment,” he said Wednesday after the ruling came down. Gastem obtained a drilling permit from the province in 2011 to search for oil and gas on Quebec’s Baie-des-Chaleurs, where Ristigouche-Sud-Est is located. After residents started voicing their concerns about the impact the drilling could have on the municipality’s drinking water, the town passed a bylaw in February 2013, setting clear rules. A two-kilometre distance had to be respected between drill sites and residents’ wells. The bylaw also banned the introduction of any chemical substances into the soil. After sending a formal notice, Gastem sued the municipality in August 2013, claiming $1.5 million dollars in damages, which was later lowered to $984,000. It argued the town adopted its bylaw hastily, illegally targeting the company and making it impossible for Gastem to pursue activities on the site, for which it had a valid permit. Superior Court Justice Nicole Tremblay ruled the company should have tried to have the bylaw annulled before seeking any compensation. In her 16-page ruling, Tremblay said contrary to what Gastem argued in court, the town council was not pressured into passing this bylaw by environmentalists or forceful residents. “The town councillors did not act on a whim,” she wrote. Tremblay said a municipality has the right to protect its territory based on the precautionary principle. Since there was no provincial law in place at the time defining the rules around water protection, Tremblay said the town was in its rights to apply its own bylaw. The judge ordered Gastem to reimburse 50 per cent of the legal fees Ristigouche-Sud-Est incurred, and an additional $10,000 to cover the fees for the public relations company the town hired. The lawyer representing the town said this punitive measure was a significant element of the ruling. Jean-François Girard said it could make companies think twice before suing a municipality that stands in their way. “I think it sends a very important message,” he said. Gastem’s Chairman and CEO Raymond Savoie said the company will take the time to review the ruling before commenting. Boulay said the lawsuit cost the town $370,000 in legal fees. The balance of what will remain, if Gastem reimburses its share, will be covered by the crowdfunding campaign launched to support the town, which so far has raised almost $330,000. “We raise our glass of water to all those who supported us,” Boulay said. Then the leftover money will be donated to other similar causes, said Boulay. Despite his relief to see this chapter come to an end, he said the issue of water protection is far from settled in Quebec. “The risk is still there. The claims on our territory are still there,” he said. Boulay said the province did little to nothing to support the town during the whole process. “I’m not even sure they were watching from the bleachers,” he said. Gastem sold its permits to Petrolia in July 2013, before the lawsuit was even filed. Under Quebec’s regulations, an oil exploration site must be at least 500 metres from a water source. Boulay said this means Petrolia could very well decide to drill 510 metres from a well. That’s why he joined a consortium of 364 municipalities that’s demanding the province establish a two-kilometre residential buffer zone to protect homeowners from drilling. Boulay said the province has yet to answer the consortium’s repeated requests, and said the mayors will be meeting in Drummondville on March 24 to establish a course of action. In her decision rendered Wednesday, Justice Nicole Tremblay considers that Gastem’s lawsuit was “difficult to describe and understand” and, above all, that it “proves to be exaggerated”. At the same time, the magistrate states that “the municipalities are recognized as a level of government and must assume their responsibilities in the protection of the environment on their territory”. It adds that a municipality “has the duty to enforce the principle of precaution on its territory” and that “the public interest was in favor of the adoption of the regulation”. 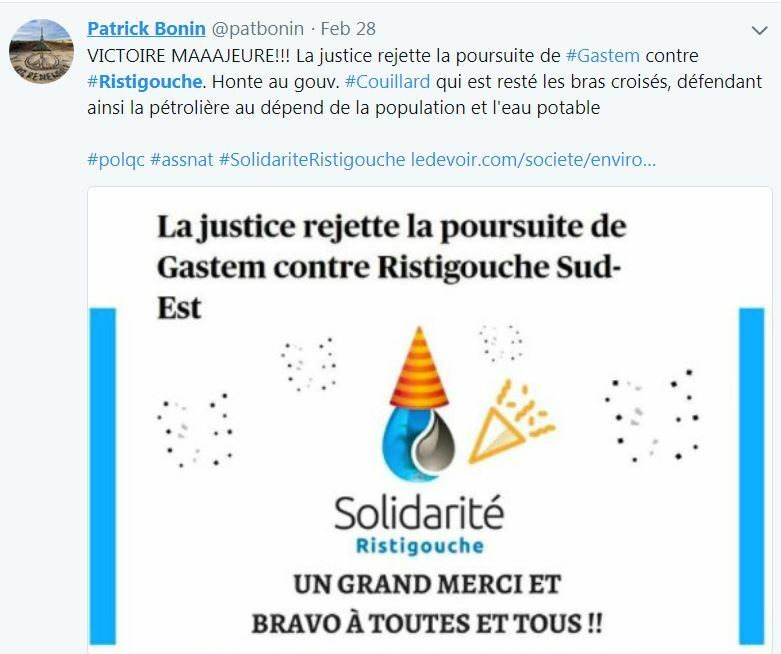 The mayor of Ristigouche Sud-Est, François Boulay, welcomed “with relief and satisfaction” the decision, which also condemns Gastem to pay more than $ 164,000 to the small municipality of 160 inhabitants within 30 days. In a conference call, Mr. Boulay said he saw in this decision an important message for the municipal world. Municipal precedence over the provincial? The mayor acknowledged, however, that the judgment does not make it possible to determine whether the by-law takes precedence over the Quebec Government’s Water Levy and Protection Regulations (PBR), which is much less restrictive than that of Restigouche Sud-Est. Justice Tremblay’s decision deals with the by-law, which was adopted before that of the Québec government. Municipal regulations, adopted in 2013 and based on available scientific data, prohibited drilling less than two kilometers from a source of drinking water on the surface and, underground, less than three kilometers from the lower limit of water. 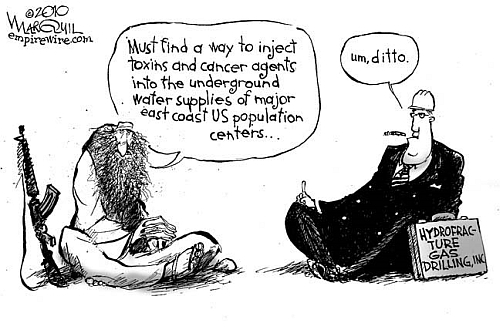 ‘aquifer. The regulation also prohibited the introduction into the subsoil of any substance likely or likely to contaminate drinking water sources, a process required in fracking extraction as provided by Gastem. The PEEP, adopted in 2014, imposes a surface limit of 500 meters and, underground, 400 meters below the lower limit of the water source, so that the by-law involves a derogation. More than 330 municipalities have adopted regulations based on the Restigouche Sud-Est, but Quebec has so far refused to say whether or not to grant the PEPP exemption. A committee of elected municipal officials is scheduled to meet on March 24 in Drummondville to decide on future steps with the Quebec government. Mayor Boulay also did not hide his bitterness at the Quebec government’s attitude on this issue, calling it “a little laughable”. “There is nothing remarkable at all. They put themselves aside. They watched the game … not even sure they were in the stands, although I imagine they were listening, “he said when asked about it. 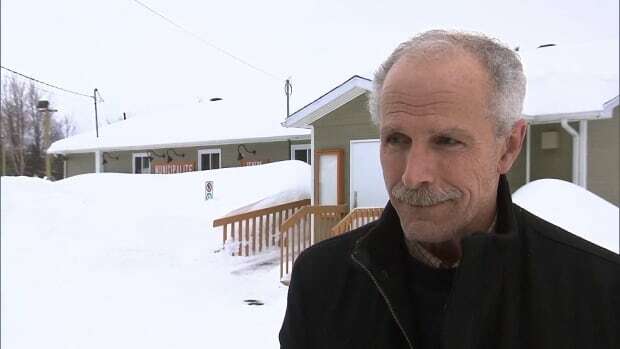 Restigouche Sud-Est launched a crowdfunding campaign to fight the oil company. More than $ 340,000 had been raised, but the costs to defend against Gastem’s lawsuit amounted to nearly $ 360,000. The deficit – which is about $ 16,000 according to Mayor Boulay – will be filled by the $ 164,000 that Gastem will pay to the city, the surplus to be spent on “another cause of drinking water protection in Canada. Quebec “remains to be identified, according to Mayor Boulay. Depuis sa fondation en 1944, la Fédération québécoise des municipalités s’est établie comme l’interlocutrice incontournable des municipalités et des régions du Québec. Visant constamment à défendre l’autonomie municipale, elle privilégie les relations à l’échelle humaine et tire son inspiration de l’esprit de concertation et d’innovation de ses quelque 1000 municipalités et MRC membres. La Cour supérieure a rejeté mercredi la poursuite intentée par la pétrolière Gastem contre la municipalité de Ristigouche-Partie-Sud-Est, après l’adoption d’un règlement pour protéger sa source d’eau potable. Cette décision devrait constituer un argument majeur pour les 335 municipalités qui veulent adopter des règles similaires, malgré le refus du gouvernement Couillard. Dans un jugement très sévère à l’endroit de l’entreprise Gastem, dirigée par l’ancien ministre libéral Raymond Savoie, la juge Nicole Tremblay conclut que la petite municipalité gaspésienne était en droit d’adopter en 2013 un règlement pour protéger l’eau potable de ses citoyens. « Loin d’être adopté de façon intempestive et précipitée, le règlement résulte d’un travail sérieux afin de répondre aux préoccupations et aux revendications des citoyens de Ristigouche », écrit-elle dans son jugement, rendu ce mercredi. Celui-ci fixe une distance de deux kilomètres entre un forage et une source d’eau. La juge Tremblay donne aussi des munitions aux municipalités. « Les municipalités sont reconnues comme palier gouvernemental et doivent assumer leurs responsabilités dans la protection de l’environnement sur leur territoire en respect du principe de la subsidiarité », souligne-t-elle. Qui plus est, la pétrolière Gastem n’a jamais pu présenter une « preuve tangible » que la municipalité aurait subi une « influence des environnementalistes ». Pire, le Tribunal conclut que « Gastem a abusé des procédures légales ». En plus de rejeter la poursuite de Gastem, la Cour ordonne à l’entreprise de verser plus de 154 000 $ « à titre d’honoraires professionnels et débours », et ce, dans les 30 jours. Gastem devra également verser 10 000 $ pour rembourser une partie des frais assumés dans le cadre de la campagne de sociofinancement lancée pour payer les frais juridiques de la municipalité de 160 habitants. Dans le cadre de sa poursuite intentée en 2013, Gastem réclamait plus d’un million de dollars à Ristigouche-Partie-Sud-Est, une somme très importante pour une municipalité dont le budget annuel avoisine les 275 000 $. Gastem, qui pourrait porter la cause en appel, n’a pas répondu aux demandes du Devoir mercredi. Le maire de la municipalité, François Boulay, a accueilli le jugement « avec soulagement et satisfaction ». « La raison et le droit ont prévalu aujourd’hui. Nous sommes soulagés que notre droit à protéger notre eau potable soit enfin reconnu », a souligné M. Boulay au cours d’une conférence téléphonique. Dans son jugement de seize pages, a-t-il ajouté, « la juge note entre autres que l’intérêt public, le bien-être collectif d’une communauté et la sécurité des citoyens doivent être soupesés dans tous les projets introduits dans une communauté ». L’Union des municipalités du Québec a aussi salué la décision du Tribunal mercredi. Même son de cloche à la Fédération québécoise des municipalités (FQM). « C’est un très bon jugement pour les municipalités du Québec, car il réitère leur pouvoir et leur devoir d’intervenir en ce qui concerne la protection de l’environnement. Le tribunal reconnaît les municipalités comme des acteurs en cette matière au même titre que les autres ordres de gouvernement », a déclaré le président de la FQM, Jacques Demers. Pour le juriste Richard Langelier, qui connaît bien le dossier, ce jugement donne par ailleurs des munitions aux 335 municipalités qui demandent à la ministre de l’Environnement Isabelle Melançon de leur accorder une dérogation au Règlement sur le prélèvement des eaux et leur protection. Elles souhaitent en fait adopter des règles similaires à celles de Ristigouche, ce qui bloquerait aux pétrolières et aux gazières l’accès à des portions importantes du territoire. « Ce jugement n’oblige pas directement le gouvernement à accorder la dérogation demandée, mais il démontre qu’en faisant cette demande, les municipalités ne font qu’exercer leurs compétences, qu’elles ont parfaitement le droit de le faire et qu’elles ne peuvent être poursuivies pour cela », explique-t-il. Plusieurs de ces municipalités doivent d’ailleurs se réunir en mars pour étudier la possibilité de recourir aux tribunaux contre le gouvernement, qui leur refuse la dérogation. Ces municipalités, qui représentent plus de quatre millions de Québécois, pourraient même réclamer la fin des projets d’énergies fossiles. Le cabinet de la ministre Melançon n’a pas souhaité commenter le dossier des demandes de dérogations mercredi, disant « analyser » le jugement. Du côté du ministre de l’Énergie et des Ressources naturelles, Pierre Moreau, on a dit que « le gouvernement a tout mis en oeuvre pour s’assurer d’établir un cadre réglementaire adapté au développement et à la mise en valeur de cette filière énergétique au Québec de manière à favoriser l’acceptabilité sociale des projets dans les communautés d’accueil ainsi que la protection des biens, des personnes et de l’environnement ». Le ministre Moreau a également indiqué que les règlements de mise en oeuvre de la future Loi sur les hydrocarbures font toujours l’objet d’une analyse. Ces règlements devraient ouvrir la porte à la fracturation hydraulique. À l’heure actuelle, 304 permis d’exploration sont en vigueur, pour une superficie de plus de 53 225 km2 de territoire. Cover slide of Ernst’s presentation. Interesting, the videos of the conference presentations were promised to be put on youtube. Not one has been. 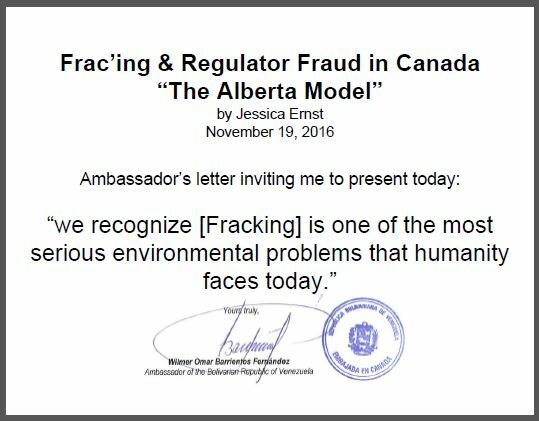 Is it because Ernst respectfully and diligently pointed out the protect-the-polluter lies by Dr. Bernard Mayer and BC OGC representative? 2015 06 04: The Most Over-the-Top-Biased Frac Panel Yet? 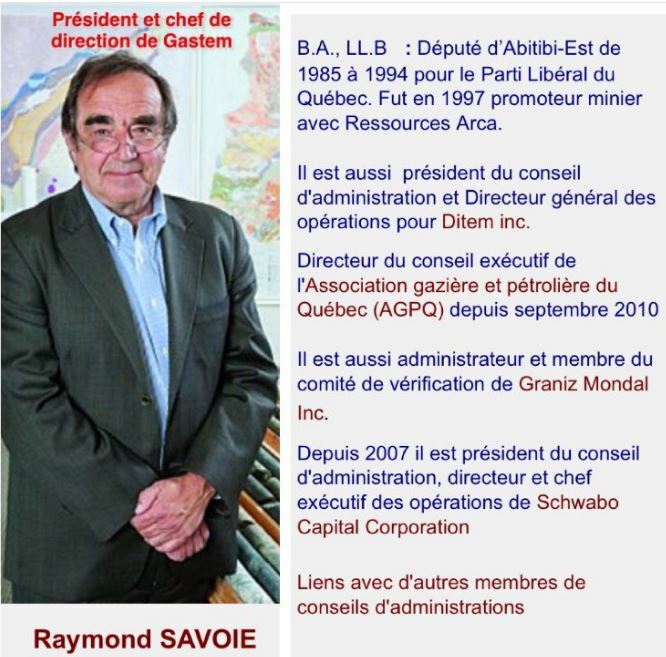 QUÉBEC Ministry of Energy and Natural Resources sold itself to the Devil. Check out this list! Check it twice! 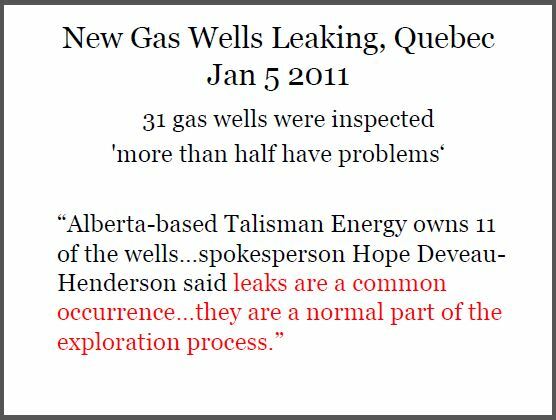 2013 04 25: Petrolia asks Quebec Superior Court to rule on Gaspé drilling ban put in place to protect groundwater, Do decisions of municipal councils outweigh drilling rights?